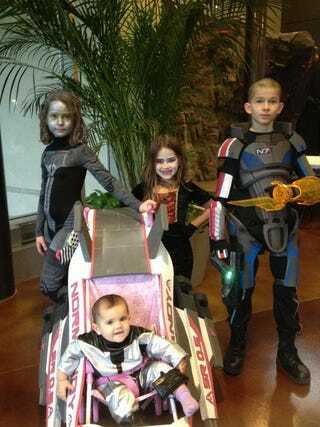 These three kids are Preston Thorne's, technical support manager for Epic Games, and they showed up at Dad's office costume party in full Mass Effect regalia. Cliff Bleszinski, formerly of Epic, retweeted this out earlier with a "WOW," and I concur. The stroller outfitted as the Normandy probably qualifies as a fifth cosplayer, but little Joker there needs a cap.